New home for Battambang 2! Thanks to the generosity of Grace Community Church in Goshen, Indiana, the kids at the Battambang 2 children's home in Cambodia will soon have a new, permanent home! The kids and staff have been praying for a permanent place since 2008, when the home was founded. The leased property the kids occupied was adequate, but not ideal for the family's needs. Now, thanks to a special offering taken last week at the Goshen church, Asia's Hope will be able to build a spacious, modern house on land the congregation helped purchase last year. The $57,268 raised exceeded the amount needed for construction, and the extra money will go for a number of other exciting projects, including a youth conference Asia's Hope will be hosting in Battambang in August. This home will be built immediately adjacent to three existing Asia's Hope homes on land that will, hopefully, soon be home to two other homes funded by Crossroads Community Church in Mansfield, Ohio. "So three years ago, we began an amazing journey of rescuing 44 kids in Asia. We have homes in Thailand and Cambodia. 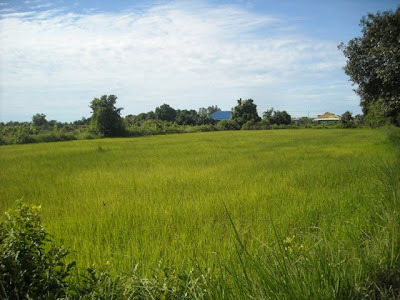 Just recently we purchased land to build a permanent home for our kids in Cambodia (pictured above). Our children have been in a rented home in Cambodia and we have longed to build a new home for them. So we prayed and set aside a date to have a special offering to build this home. Well, yesterday at the end of the service we took a special offering for this project and we collected 57,268.56. Enough to do the project. Way to go Grace Community Church... These kids and a few more pictured above will receive that news this week and they will be dancing into the night! I SURE do love my church and the way they care for the needs of the world. I cant wait to be there with them to celebrate this new home! Shouting from my laptop!"